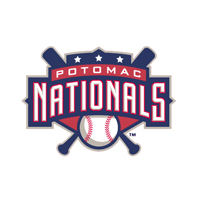 With three runs in the home half of the first inning, the Potomac Nationals (37-30) picked up a win in their final game of the first half. 2B Edwin Lora plated two runs with a single in the opening frame in a 4-2 victory over the Buies Creek Astros (37-32). Potomac took three of the four games in the series vs. Buies Creek. The Astros entered Sunday afternoon’s matchup with the best record in the Carolina League when scoring first (29-5), but despite a run three batters into the game, the Astros failed to add to that mark. RHP Sterling Sharp (W, 5-3) issued a one-out walk in the first inning to 2B Osvaldo Duarte, while DH J.J. Matijevic followed with an RBI double. It was Buies Creek’s only run in six innings against Sharp. Down 1-0 after half an inning, Potomac sent eight men to the plate in the home half of the first inning against RHP Brandon Bailey (L, 2-7). The first two batters reached against the right-handed starting pitcher, while a one-out walk by 1B Ian Sagdal loaded the bases. After Bailey struck out LF Jack Sundberg, C Jakson Reetz drew a bases loaded walk, which tied the game. Lora followed up with a two-run single to centerfield, which put Potomac ahead 3-1 and proved to be the game-winning hit. Potomac added a run in the seventh inning off of RHP Abdiel Saldana, as Sundberg made it 4-1 with a sacrifice fly, while Buies Creek answered in the eighth inning with a run off of LHP Jordan Mills, as 1B Jake Adams made it 4-2, the eventual final, with an RBI single. RHP James Bourque (SV, 3) worked a perfect ninth inning and closed out the Potomac victory. The P-Nats finished the first half with the top record in the Northern Division, and over .500 both at home (17-15) and on the road (20-15). Potomac joined Winston-Salem as the only team to have a winning record both at home and on the road in the first half. After a three-day break, the P-Nats will return to Northwest Federal Field at Pfitzner Stadium on Thursday night, as they will begin a four-game series with the Wilmington Blue Rocks (Kansas City). First pitch at Northwest Federal Field on Thursday is set for 7:05pm. The Potomac broadcast will get underway at 6:50pm with the P-Nats Leadoff Show. You can listen to the Potomac broadcast at potomacnationals.com or on the TuneIn Radio App.